A wide variety of foods may cause or aggravate skin diseases such as contact dermatitis, contact urticaria, or atopic dermatitis (AD), both in occupational and private settings. The mechanism of action underlying allergic disease to food, food additives, and spices may be immunologic and non-immunologic. The classification and understanding of these reactions is a complex field, and knowledge of the possible reaction patterns and appropriate diagnostic test methods is essential. In addition, certain foods may cause worsening of atopic dermatitis lesions in children. The atopy patch test (APT) is a well-established, clinically useful tool for assessing delayed type reactions to protein allergens in patients and may be useful to detect protein allergens relevant for certain skin diseases. 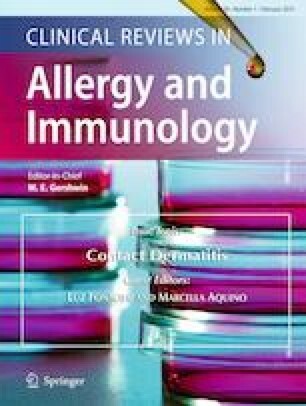 The APT may even detect sensitization against allergens in intrinsic atopic dermatitis patients, who show negative skin prick test and negative in vitro IgE test results against these allergens. Native foods, SPT solutions on filter paper, and purified allergens in petrolatum have been used for APT. The European Task Force on Atopic Dermatitis (ETFAD) has worked on standardizing this test in the context of AD patients, who are allergic to aeroallergens and food. This recommended, standardized technique involves test application at the upper back of children and adults; use of large, 12-mm Finn chambers; avoidance of any pre-treatment such as tape stripping or delipidation; standardized amounts of purified allergens in petrolatum; and use of the standardized ETFAD reading key. The APT may not be the best working or best standardized of all possible skin tests, but it is the best test that we currently have available in this niche.